Sam moves further north for training with a revolutionary new rifle that’s going to change the course of the war – no, really! A hundred years ago this week… On the Western front the German retreat to the Hindenburg Line defences continued, largely according to plan and including numerous counterattacks to prevent the Allies’ advance breaking into a gallop. So the British and Canadians took villages including Bouvincourt, Vraignes and Tincourt (March 26-7), then after much harder fighting Neuville-Bourjonval (29), Heudicourt, Sorel and Fins (30), and Savy (April 1). Similarly, the French Army reached the Forest Of St Gobin and the Aisne-Oise Canal (March 27) and moved forward northeast of Soissons (April 1), while the Germans struck back temporarily near Maisons de Champagne (28) and began an artillery bombardment of Reims (April 1). The great Russian military effort at last showed signs of waning – amid the upheaval back home that had already seen the end of the Tsar and the Romanov dynasty; the Germans drove them back at Baranovichi, Belarus (March 26), and their attempted attack at Magyaros Ridge Moldavia failed (28; part of the war in Romania). Through the week, relatively minor actions continued in northern Italy (March 26-9; Austrian attacks), and Macedonia (26 and April 1; onslaughts by the French, then the Bulgars and Germans), while the British pursuit of Ottoman forces north of Baghdad, Mesopotamia, known as the Samarrah Offensive proceeded – in fact, nearly joining up with the far-flung branch of the Russian Army which had been chasing the Turks out of Persia and now took Khanikan 85 miles northeast of Baghdad. However, the most substantial single conflict was probably the First Battle Of Gaza, Palestine, where one contemporary account had the British “snatching defeat from the jaws of victory” by a surprise withdrawal, maybe provoked by fear of Ottoman reinforcements arriving, maybe concerns about lack of water (March 26-7; British casualties 4,000 including 523 dead, Ottoman dead 2,447). 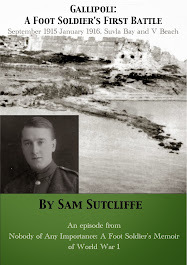 Last week, after a long period in hospital averting meningitis and suffering “war sickness” (that’s what the sagacious doctor reckoned), Sam returned to his Battalion and got to know his comrades – the song-and-dance man, the opera singer, the heavyweight boxer… and the almost unanimously miserable set of officers, from Colonel to Captain to his Company Sergeant Major. ‘Pal McIntyre and I, along with three chaps formerly unknown to us – Metriam, Naylor, and Rutven – were suddenly ordered to pack our kitbags and handed rail vouchers and papers authorising us to proceed northwards from Yorkshire to a school of musketry. Why we five were chosen we knew not. Nor, so far as I could ascertain, did anyone else. We arrived at a hut encampment adjacent to a colliery**. The winding gear and buildings and large slag heap formed the only noticeable features of the local landscape. We joined a hundred or so men from other Battalions living there. The huts had broad floors with beds of mattresses resting on low, board trestles with four blankets per man (twice the usual issue). Heat came from two large anthracite stoves, a zinc bath full of coal beside each of them. Unofficially, we were warned that this quantity of fuel, issued daily, comprised only half of what we needed to keep the hut warm. However, nods and winks advised us what to do about that, the pit being so handy. We spent the few remaining hours of that first day settling in, finding the small canteen, getting to know our hutmates, and scanning the order board for information about the training programme and which group each of us had been assigned to. Each group of ten men had a Sergeant-Instructor to train them, two sessions daily, 9 to midday and 2 to 5pm, Monday to Friday in the first week, Monday to Wednesday in the second. Thursday and Friday of the second week would be given over to testing the abilities of pupils as lecturers and demonstrators of what they had been taught. For a third week the whole school would move to a firing-range camp near Mansfield, Nottinghamshire, for further instruction and tests. A cheerful assembly awaited the arrival of the Commandant in the camp hall. Despite the low temperature – snow a foot deep – good grub and curiosity kept our spirits high… Even higher when we saw a tall, burly officer of middle age walk steadily up the aisle, ascend a few steps on to a small stage, then, with a careful gaze, turn and survey his audience. In a short speech, he made it clear we should regard ourselves as responsible NCOs chosen to spread knowledge and initiate our respective Battalions’ training in the use of a new rifle, designed after much research. This weapon contained all the best features of rifles used by the British, Canadian and Japanese armies. I remember my surprise that the Army should still show so much interest in a manually loaded, single-shot gun: the heavy machine gun had been sensibly assigned its role in support of infantry, while the Lewis gun***, lighter and carried by one man, had become the infantryman’s automatic weapon and would soon be available in large numbers. Many of us thought revolvers or automatic pistols would better suit us footsloggers — lightweight, slick and confidence-giving. Of course, officers already carried revolvers. But the Army top brass was and still is deeply class-conscious and abhors easements for people in the lower ranks. For instance, of what real use is a sentry? He stands in his box or patrols his beat, a target fully exposed to those who intend to do wrong. If he were seriously intended to guard property or persons he would be suitably armed, not with rifle and bayonet, and be either so placed that he could apprehend by surprise — or else have freedom of movement. But if this system of guarding were adopted, the ancient routine of showily saluting officers who pass the sentry’s position would end, and commissioned people’s vanities be wounded; rather than that, a war should be lost. Which brings us back to this marvellous rifle, the expense of bothering with it in the middle of World War, and of training instructors to introduce it. We remained content to play our part simply because the officer commanding the school had the appearance and bearing of the soldier’s ideal officer — and the useful ability to make each of us feel important. He told us that, on completion of the course, we should be capable of instructing men of all ranks about the construction, special features, and correct method of firing the new rifle. We believed all this and worked really hard to satisfy him. ** My father never mentions the name of this place, but I think I recall him saying it was Cramlington, Northumberland. *** Devised by US Army Colonel Isaac Newton Lewis in 1911, with the magazine a distinctive rotating drum holding either 47 or 97 bullets, which could be fired at 5-600 a minute; it weighed 28 pounds, half as much as a contemporary Vickers machine gun; when the American Army rejected it, Lewis sailed for Belgium, then England, where he worked on manufacture with BSA in Birmingham; the British Army approved it in October, 1915, and Lewis guns came into common use early the following year, about 50,000 of them – including a belated American model – on the Western Front by the end of the war. Next week: Between training sessions on the new rifle, Sam and Mac develop a whole new skill – stealing tin baths of coal from the adjoining colliery via hazardous night-time forays in the snow. A hundred years ago this week… Germany’s all-out submarine war claimed the French battleship Danton (March 19; torpedoed off Sardinia, 296 dead, 806 rescued) and British hospital ship Asturias (21; torpedoed off Start Point, Devon, “only” 43 dead because 1,000 wounded previously taken ashore at Avonmouth). The U-boats seemed a real threat to the successful trend of Allied actions on land. On the Western Front, it must have been difficult to determine the significance of the Germans’ planned retreat to the Hindenburg Line. The Allies pursued them, of course. But when they evacuated Boyelle and Boiry Becquerelle (March 19; Pas-de-Calais), they left outposts whence they raided the advancing British before slipping away at night (20-21); when the Australians attacked a little further south at Noreuil (20), the Germans beat them back, causing heavy casualties, and again at Croiselles the following day. Further, the French Army suffered a substantial blow when they were beaten back across the Crozat Canal, losing ground they wouldn’t regain for more than a year (22; the Canal connected the Somme and the Oise). On the Eastern Front, though, the great concern remained that the Russian Army’s prodigious efforts would collapse or be terminated by political decision as the first few days of post-imperial government by the Duma (legislative assembly) unfolded. It seems extraordinary to note that, unaffected by events at home, in western Persia the Russians took back Qasr-i-Shirin (March 25) from the Turks whom they’d effectively defeated in the region by then. Elsewhere in the Middle East, the Allies reached a new peak of aggression. The British/Anzac Egyptian Expeditionary Force of 23,000 infantry and cavalry prepared to invade Palestine from the south, Gaza the first target – although their intelligence reported the Ottoman garrison as 2,000 strong when it was twice that. By March 25 they were set to launch an attack. At the same time, in Mesopotamia, the British/Indian Samarrah Offensive proceeded with the taking of Fallujah(!) a major coup (19). Last week, after weeks of struggle with the threat of meningitis and actual German measles and what the doctor diagnosed as general “war sickness”, Sam from isolation hospital to his Battalion, only to find himself and his fellow underage veteran comrades treated as a strange kind of outcast. The trouble was a whole weird story/myth around this Harrogate-based “Lost Division” who’d been stigmatised, rightly or wrongly, because they hadn’t been posted abroad at all during the first two years of the war. Before his illness, Sam acknowledged he felt prejudice against them. Then, on his return, when he tried to “really become one of them”, they rejected him. 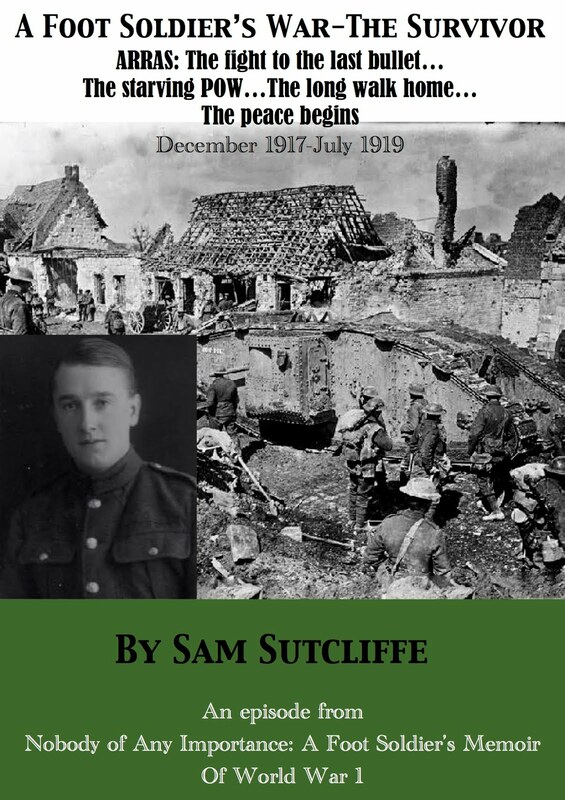 This uncomfortable situation only deteriorated because Sam’s Company Officer, Captain Tarquin – the name probably an alias** – earned the contempt of all with his “childish, short temper”, “avoiding eyes” and fondness for useless spit and polish. ‘I can’t remember anything about this Captain’s subalterns, but the Company Sergeant Major was tall, round-shouldered, with a pale, worry-ridden face, obviously overborne at all times by the bossy Captain. One Sergeant stands out in memory as an efficient, well-trained NCO – young, strikingly well-made, and full of good health, he contrasted greatly with those of any rank in our Company. One wondered how it came about that such a gem among so many duds remained on the home front, his qualities wasted. However, the Battalion rank and file boasted skills of a wide variety. A few were professional entertainers. A song-and-dance man in my Platoon could put over, unaccompanied, a really fine act. An opera singer had earned his living as a top chorus man, said the knowledgeable. And then we had craftsmen of many trades, including one painter of miniatures who could produce perfect little scenic pictures or portraits on demand. Notable on the sporting side, Big Bonito, a heavyweight boxer, didn’t have to defend himself against such puny amateurs as ventured to challenge him at Regimental tourneys. He let most of them punch away at his huge trunk till exhaustion defeated them, or else a swift unexpected flick of one of the otherwise lethargic Bonito’s gloves persuaded them to remain where they’d finished up, on the canvas (if there was one). I saw the Colonel several times: short, fat, red-faced, and, as far as I could tell, devoid of any of the attributes leadership required. “He’s an ironmaster,” someone told me. That may have been his major contribution towards victory, for we had no opportunity to see his military talents in action against the Kaiser’s. 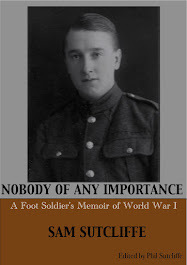 His brief speeches to the soldiery on social or sporting occasions were as inspiring as my father’s used to be at half-time during a church soirée and dance – and just as inaudible***. ** My father usually aliased friends and foes alike because, writing in the ’70s, he didn’t want to cause distress of any kind to those still alive or their descendants. *** See the childhood section of my father’s Memoir – Sam’s father, Charles, was a shy man, confidence much diminished by having presided over the ruin of the family business in Manchester (when Sam was two years old) and, consequently, the least inspiring public speaker imaginable. **** Probably a song called A Dream Of Delight by Horatio Nicholls and Mabel Manson, published 1916. 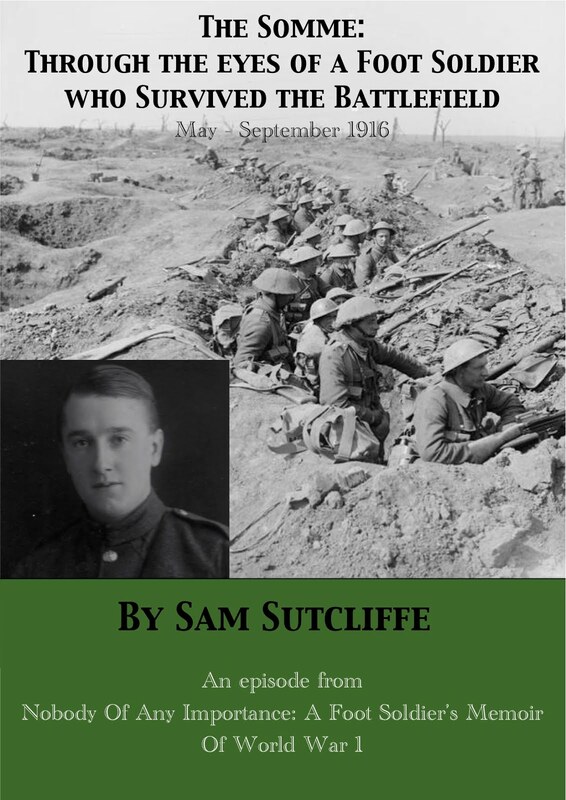 Next week: Sam’s suddenly on the move again – further north with a small group of comrades for training as instructors in how to use a revolutionary new rifle that’s going to change the course of the war – no, really!